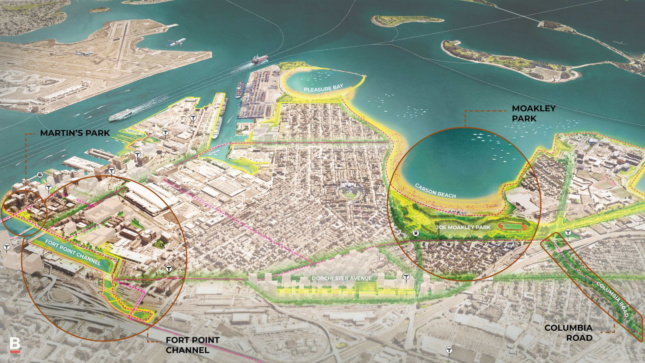 The city of Boston has unveiled a new vision for protecting the city’s 47 miles of shoreline and has used New York’s SCAPE Landscape Architecture to visualize the vision plan. 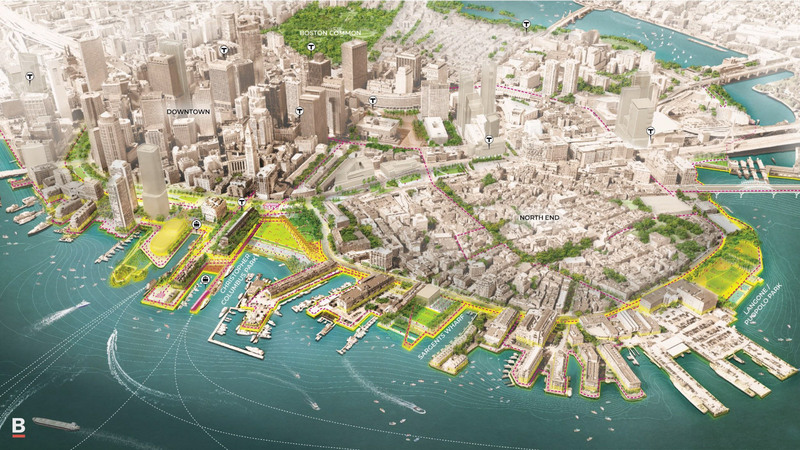 The plan, “Resilient Boston Harbor,” was presented yesterday by Mayor Martin J. Walsh before the Greater Boston Chamber of Commerce. It builds off of the Climate Ready Boston 2070 flood maps and existing district-level plans, coastal resilience neighborhood studies, and the work done under the Imagine Boston 2030 initiative. The ultimate goal is to reinforce Boston’s public spaces, buildings, and infrastructure against the encroach of rising sea levels, the strengthening of storms that climate change will bring, as well as heat waves, drought, and worsening blizzards. With Boston’s population approaching 700,000 for the first time since the 1960s, catastrophic flooding would affect more residents than ever. To meet that ambitious goal, the city has broken down its plan into separate chunks for each neighborhood. The final goal involves opening up public access to the waterfront by raising portions of the coastal landscape, installing strategic flood walls, elevating infrastructure, and flood-proofing buildings, representing a synthesis and consolodation of the prior resiliency work done in the city. 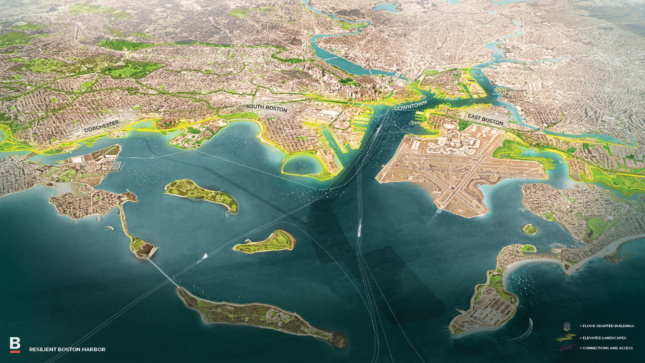 In East Boston and Charlestown, Wood Island and Belle Isle will be reinforced to prevent the loss of Boston’s only remaining salt marsh, and the most important transportation corridors will be elevated. The Schrafft Center waterfront will also be redeveloped to incorporate elevated parks and boosted economically by the addition of new mixed-use buildings. In South Boston and Fort Point, Fort Point Channel is currently a major floodway that will need to be redesigned, and a string of parks, dubbed the “Emerald Necklace,” will sop up excess floodwater along Columbia Road. In North End and Downtown, the Harborwalk and Long Wharf are slated for renovations, and the city is planning to kick off a Climate Ready Downtown study to pinpoint further optimizations. Similarly, Boston will launch Climate Ready Dorchester to study improvements to the Dorchester Waterfront. A redesign of Morrissey Boulevard to buffer it against flooding, and the opening of the waterfront along Columbia Point, have already been singled out as potential strategies. The cost won’t be cheap, but Mayor Walsh rationalized the expense as preventative. “In East Boston, we could invest $160 million in resilience or we could do nothing, and expect damages of $480 million,” Walsh told the Chamber. “In Charlestown, we could invest $50 million now or pay over $200 million later. In South Boston, we could invest $1 billion or we could pay $19 billion in citywide damages, when Fort Point Channel and Dorchester Bay meet and flood the heart of our city. The city will start by investing millions at each of the above sites and ten percent of all future capital funding towards resiliency initiatives. Still, the north-of-a-billion-dollar estimates will require funding from Massachusetts, the federal government, and private, non-profit, and philanthropic organizations. Besides hitting the goals outlined in Resilient Boston Harbor, the city is also committed to going completely carbon neutral by 2030.